One thing we avoid at Vanilla is doing "wishlist" features. That's where someone says "wouldn't it be great if I could do X" and that gets rolled into core or even becomes yet another addon without some critical thinking applied. That's the road to bloated software that's hard to use because it doesn't have an opinion. Great software means making informed decisions in the design process, and to do that, we need some concrete goals. We've been talking about user stories as a vehicle for making sure we are fulfilling actual needs, not wishes. So when we starting thinking about adding a feature, a good starting place is collecting some user stories so we know what we're trying to accomplish and not designing in a vacuum. To get involved in a our larger issues, feature discussions, and even our pull requests, thinking about the user stories we are trying to fulfill (and adding your own) is a great way to participate usefully in the feedback process. User stories are an extremely valuable way that a forum owner or community manager can contribute to the development process without being a developer. Collecting actual stories from existing communities is the best way of showing something isn't just a wish. My User Story could include the above issues with the forum , any forum ? I mean these kinds of things hamper the user experience in my opinion under any circ. @Linc: Mmh, i do not really get it it. Not your post and also the description of the website does not explain to me what it is about (maybe i do not understand it from a cultural view?). Do you mean that non-developers should explain their community needs more descriptive so developers understand why they want that functionality in Vanilla? Or is this a new style of writing we should adapt to in this forums?! For example: "My users write lazy discussion titles, so i need a plugin that reformates titles when the discussion is postet. The first letter should always be Uppercase to make the forum look more accessible." "Vanilla helped me to grow a fan base for my skateboard designs, this is why i concentrate on community marketing." I 2nd better links and better line breaks for the desktop version of the forum here. What I've seen a few times in my forum is users answering to old comments, when their last unread comment is not on the last page. They seem to ignore the pager,assume they got directed to the last page, see the comment form and write an answer. I tried making the pagination more obvious, but the only thing that helped was injecting CSS to hide the CommentForm when Page < TotalPages. Don't know if that counts a a user story, but I think you will hear more admin stories than user stories on this forum. Do you mean that non-developers should explain their community needs more descriptive so developers understand why they want that functionality in Vanilla? Close. Maybe: "As a forum administrator, I need a way of enforcing some basic style conventions in discussion titles so that the value of the content in them is clearly communicated to members and guests, increasing my traffic". "As a forum administrator, I need to make it clearer when users are not on the last page of a discussion, so they don't drop non-sequiturs into the comments because they didn't read the entire discussion." We identify the problem first, rather than prescribing the solution immediately. I think you will hear more admin stories than user stories on this forum. We're all forum users, too. so if we were going to translate vrijvlinder's suggestion from something that is easily understood to something easily understood, but using correct user story syntax. so would this be a user story? As a user, I would like to be able to more clearly see links within comment and discussion body. with regards to vanilla forums. p.s. as a developer, this would not be a problem on my own forum since I can adjust my theme. As a user, I want to be able to more clearly see links embedded in post text so that I know they are clickable and don't miss context. User stories is a term used in agile software development. All users (admins, developers, end-users, etc.) have different goals. User stories aim to capture that so the developers of a specific software can translate that into functionality that will actually be used. User stories are part of an agile approach that helps shift the focus from writing about requirements to talking about them. All agile user stories include a written sentence or two and, more importantly, a series of conversations about the desired functionality. As a user, I often start writing a reply to a discussion and come back to it after some time. Once I post, I notice someone else has already replied, making my contribution obsolete. As a staff developer, I sometimes find that community members write better answers than I do, making me wish I'd thought of it. @hgtonight said: They prompt discussion. 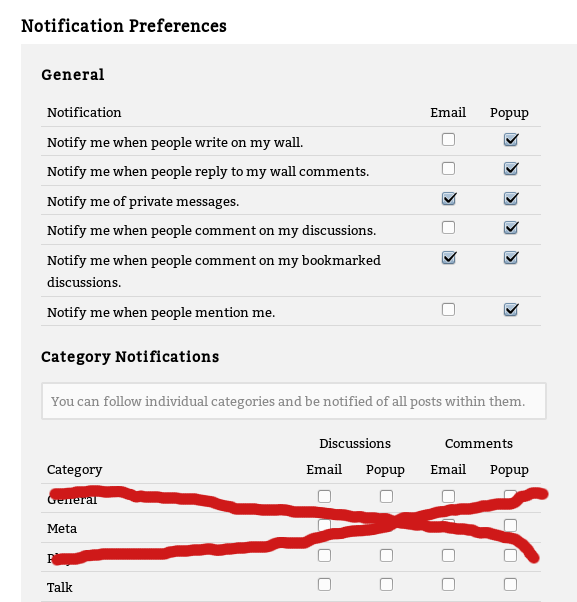 As a forum administrator, I would like to able to allow advanced notification preferences only to a specific category. But it needs more explanation. e.g. only display Talk category as an option to users for advanced notifications instead of all categories. to limit the number of emails to all users just for one category, but not allow them to select all of the categories. You're missing the third part of the story: As X, I want to Y, so that Z. In other words, you've given perspective and the goal, but you're missing the "why", which I think is particularly important for this use case, because it's probably going to be different than the intended "why" for the overall feature. As a developer I have found that views can still contain a lot of logic, which makes making template changes a little bit fraught, and also I have found clients have struggled with this too even leaving leaving out essential logic, this is due to lack of separation of concerns. I wonder if an in-between step, would be easier, separating views and templates, so you have controller logic, view/helper logic and templating. As developer in other framework I have found template block syntax, intuitive and easy to override. As a developer and observer, I have found that themer often don't realise how important certain attribute values as for client scripting, becuase they are not easily identifiable as a convention, and they aren't always consistent. @linc said: You're missing the third part of the story: As X, I want to Y, so that Z. "to limit the number of emails to all users just for one category, but not allow them to select all of the categories." e.g. an Announcements (or whatever name) category that all users can post to that would go out to all users who select that notification preference, but not open all categories to the advanced notification feature so as not to swamp the mail queue, which would not be scalable. @linc: Thanx for explaining. I'd better not participate in this user stories. Naaag!